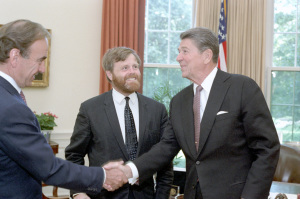 A fascinating story of Cold War skulduggery and the fashioning of a secret alliance between Ronald Reagan and News International supremo, Rupert Murdoch unearthed by Robert Parry, on the always interesting Consortiumnews.com website. 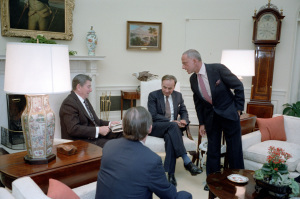 Murdoch had already forged a relationship with the Thatcher government in Britain, which had paid handsome business dividends for his media group, and the partnership he established with Reagan came on the eve of his move into the US media scene and the creation of the Fox News franchise which would establish Murdoch as the champion of the American Right. “I pointed out to Murdoch that I had seen these photographs and they are not comprehensible to the lay person. Murdoch responded that he would commission credible analysts to be briefed here. They could make the photographs understandable to the average individual with circles, arrows, and other enhancements.” The next section of Wick’s letter remains classified – more than three decades later – on national security grounds.